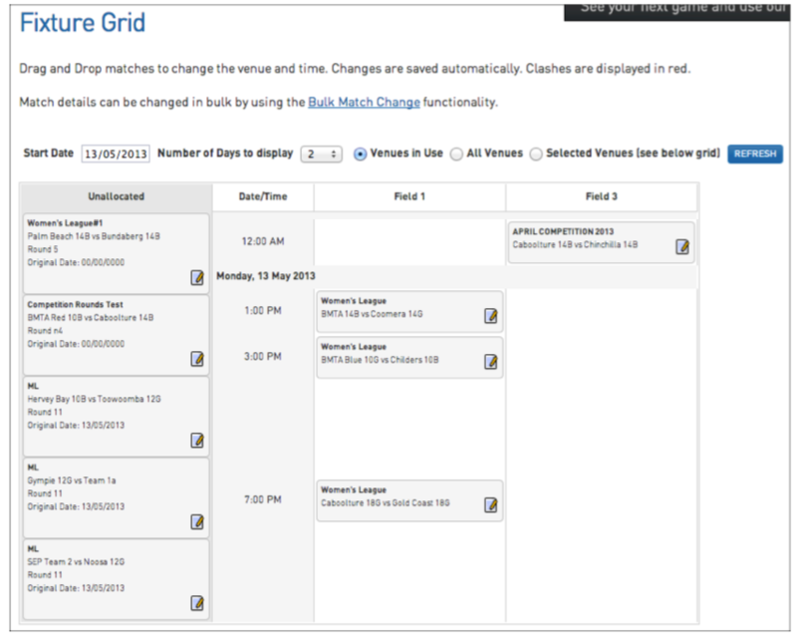 The Fixture Grid functionality allows an administrator to graphically display matches that are due to be played between certain dates and times at specific venues. It also allows matches to be moved into new time, date and venue slots manually using drag and drop technology. The fixture grid will display as below. Across the top of the grid you are able to filter out the matches that are displaying by entering a start date, the number of days to display and the particular venues you wish to display. Unallocated matches for the date range will display on the left hand side. To allocate them to a time slot and a venue simply click and drag and drop it into the time slot. Any matches that clash will come up highlighted in red. To resolve the clash simply drag the match to a new time slot/venue. Match details can also be edited from this page. To edit the match time, date, teams etc. simply click on the paper and pencil symbol next to the match. To add in any extra time slots fro a venue you will need to add in Venue Start Times as detailed above.